Hughie Ferguson was a goalscoring hero in Scotland. In 1927 He became one in Wales when he scored the goal that won the F.A Cup for Cardiff City. Three years later he committed suicide. Ferguson was born in Glasgow in 1895 and first came to prominence playing for Parkhead who were one of the leading clubs playing in Scottish Junior (non-league) football, competing in the Glasgow Junior League. After playing a leading role in Parkhead’s victory over Glasgow Port Authority in the 1915 Scottish Junior Cup Final, Ferguson was snapped up by Motherwell. Already 21 when moving to Fir Park, he went straight into the team, given his chance by John ‘Sailor’ Hunter who managed the The Well for 35 years, and got off to a flying start with a brace against Raith Rovers. Next came a hat-trick against Dundee and just like that he was established as one of Scotland’s leading marksman. 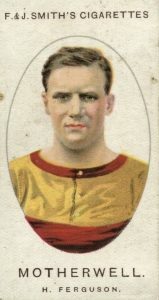 Ferguson finished as the club’s top scorer in every season he spent with Motherwell and compiled an astonishing record of 284 goals in 288 games. In his second season with the club he was also leading scorer in the Scottish League, a feat he would repeat twice more. Motherwell were constantly struggling financially during Ferguson’s time with the club and the only surprise was that they managed to hold on to their star striker for as long as they did. He helped them to a third-place finish in the league and to the semi-finals of the Scottish Cup. The major surprise is that Ferguson was never chosen for his country. The Scottish selectors preferred Andy Cunningham of Rangers and Andy Wilson of Middlesbrough for the centre-forward role. He was chosen three times for the Scottish League XI and scored three goals. In 1922 Manchester City bid £3,500 for the striker which was refused as ‘Well were holding out for £4,000. City then came back with an improved bid of £3,900 which was accepted but the player vetoed the move. In 1925 the switch to the Football League finally came, but it wasn’t to England. Cardiff City came in with a bid of £5,000 for the Glaswegian, £1,000 less than the transfer record at that time and he joined the Bluebirds halfway through the season. His departure was keenly felt in Motherwell. The steelworks in the North Lanarkshire town closed for an hour in order for the staff to join crowds lining the streets to bid their local hero farewell. 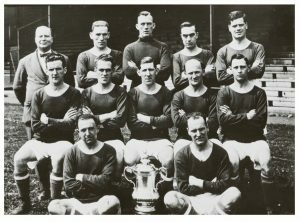 Cardiff, Cup finalists in the previous season, gave Ferguson his debut against Leicester City on 7 November 1925 where he lined up alongside fellow Scots Jimmy Blair and Jimmy Nelson. He scored in a 5-2 win. Ferguson continued scoring in South Wales. His big season came in 1926-27 when he finished with a total of 32 goals, the most important of which were the ones in the F.A. Cup. He netted five times in the run to the final and also found the club a lucky mascot. Prior to the 5th round tie at Bolton, Ferguson was enjoying a round of golf at the Royal Birkdale course. Just as he was about to drive his ball he felt a black cat brush against his leg. The drive went straight and so did the driver – straight off to find the cat’s owners. 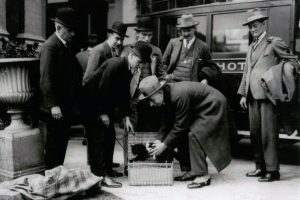 When he found them the Scot asked if he could borrow ‘Trixie’ for the remainder of Cardiff’s Cup run, promising tickets for the Final should they get there to the cat’s slightly shocked owners and the deal was done. Trixie was at Bolton where Cardiff saw off the home team 2-0 with Ferguson scoring one of the goals and also saw the team knock Chelsea out at the quarter-final stage with the Scot again on the scoresheet. Ferguson was no doubt cheered on by Trixie as he scored twice in the 3-0 semi-final win over Reading at Molineux and so it was off to Wembley with lucky cat and lucky cat’s owners in tow. Ferguson is out of picture but his shot squirms under Lewis’s body to give Cardiff the Cup. At Wembley Cardiff and Arsenal fought out a mostly dour battle. 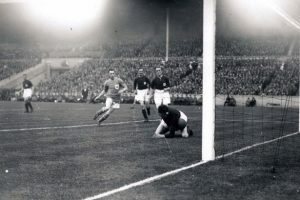 In the 76th minute Ferguson tried a speculative shot which slipped through the grasp of Arsenal’s Welsh goalkeeper Dan Lewis for the only goal of the match to take the trophy out of England for the only time. The win led to the permanent ‘transfer’ of Trixie to South Wales and she saw out her days at Ninian Park. 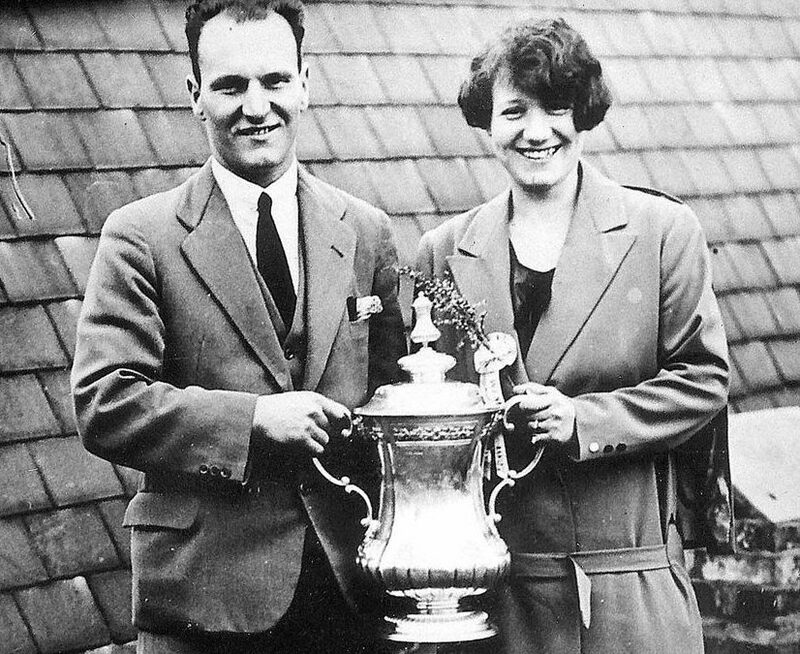 After scoring to help Cardiff win the Charity Shield against Corinthians at the start of the following season, Ferguson began to be troubled by back problems which limited his playing time during the 1927-28 season, although he did score the two goals that won his team the Welsh Cup over Bangor. During the following campaign Ferguson played even less although when he was fit he was just as lethal as evidenced by a five-goal haul against Burnley in September 1928. In total Ferguson spent just under four seasons at Ninian Park, scoring 91 times and in 1929 a financially strapped Cardiff sold him to Dundee for £500. Back in Scotland the back troubles appeared to get worse and Ferguson seemed to lose his touch with a demanding crowd expecting more of him. The lack of form, and the criticism he received bedevilled a man who had known nothing but adulation up to that point and within three years of scoring the goal that win the game’s biggest cup he had committed suicide. Painters working at Dundee’s Dens Park stadium discovered Ferguson laying over a gas ring in a kitchen at the back of the main stand with his cap drawn tightly over his head. At 33 years old, Ferguson left behind a wife, two children and an unborn son. The Ferguson family have their own take on the great goalscorer’s suicide. They claim that he was suffering from an ‘imbalance of the inner ear’ caused by an undiagnosed brain tumour. The problem caused him to fall over at times without warning which, of course, affected his game. He also suffered from insomnia which became worse with the inner ear problem. It might seem strange that a 33-year-old man with two young children and another on the way, and one cherished as a true hero in two footballing communities would decide to end his life when it was still supposedly near its peak. The ultimately sad tale of Hugh Ferguson and the taking of his own life, whether caused by the undiagnosed tumour or merely depression is yet another reminder that sometimes it is impossible to know or understand what people are going through.